370,000 word, 23,000+ definitions Dictionary-Glossary. 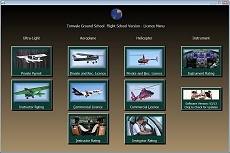 The Tomvale Ground School Software Suite is the best way to study for your aviation exam, remain current, or learn about aviation. It's a comprehensive set of programs for pilot training, available for all licenses and ratings, and used by flight schools and colleges across Canada, as well as thousands of pilots. It can be used on any Windows based device. It is not an online program but rather a set of programs installed on your computer..
Thousands of Questions to prepare you for the exams, with a Question Order Menu. Banks are ordered as in the Transport Canada Exams. All beginning licences include the PSTAR and a 'Novice' Bank, and Commercial Licences include a 'Challenge' Bank. A Progress Chart which keeps track of your last 30 scores on all the question banks. A Pop-Up Dictionary/Glossary with definitions, photographs and videos. Full feature Aviation Calculator with all aerodromes and heliports in Canada and the U.S.A. Weather Report Decoder which decodes TAFs and METARs and gives you notes on the format and weather codes. Help Classroom, an Aviation Encyclopedia with articles and visual aids on hundreds of topics. Ordered Help Utility which shows you only the Help Chapters you need to read. The entire applicable CARs text, Aeronautics Act, the Radiotelephone Handbook, and a Search Utility which finds any word string in these documents. Page Reference Utility which keeps track of, and lists the page references and Help Chapters for the questions you answered incorrectly. The Transport Canada Study and Reference Guide for each license. The new Tomvale Pilot Logbook, a what-you see-is-what-you-get Logbook. My Notes where you can take notes for yourself while you work and print them later. The Flight School Package includes a Licence Menu and a Student Progress Utility which keeps track of 300 students per licence. FREE download version to those who have purchased within the last month. Requires PC with any MS Windows after Win 98. Not compatible with MAC or IOS. Once installed, a net connection is not necessary. Individual license packages are for single users only. They may not be used in a Flight School. After your purchase, we will email you a download link to install the software. The first time you run the software you will need an Activation code, which we will send you when you click on 'Request Code'. The code will be e-mailed to you with your software confirmation as soon as possible. Thank you for your patience. Choose the Licence and Category with the Dropdown Menu, and click the 'Buy Now' button. We produce an update 3 times a year. After your initial purchase, updates are 40% of the original software price. If you have previously purchased our software, you can order an update for the same licence below. Not sure which software package to order?